Fountain Computer produces high quality software tools for scientific analysis, 3D graphics, geographic information systems and consumers products. We also produce Delphi libraries, components and objects. 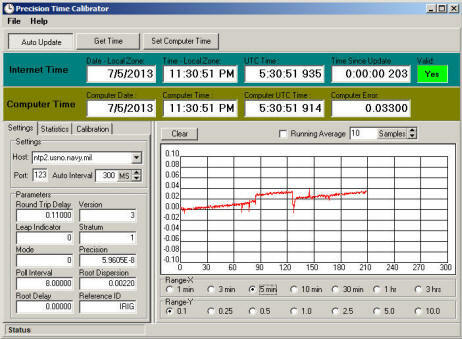 The Precision Time Calibrator is a tool for analyzing and controlling the performance of the Real Time clock in a PC. The program queries atomic clocks on the internet and compares these high precision time bases to the current time in your computer. It then displays any error between your computer and the atomic clocks. The display shows the absolute error as well as a graph of how the error changes over time. This makes it easy to see exactly how much the clock on a PC drifts over time and allows you to make adjustments to correct for drift. Windows Image Tracker. Windows Image Tracker (WIT) allows you to track any image on the internet over time. If the images are comes from web cam or any other source that changes over time, the images can be combined to create animations that show how the images. This is ideal for tracking weather radar, web cams, satellite images, seismograph data and many other things. The animations can be saved and play later, creating a permanent record of events. The are even tools for enhancing and editing images. Audio Delay. Audio Delay is a program that allows you to delay any audio signal fed through your PC. This is useful for synchronizing audio with another media source. For example, people often like to listen to local radio play-by-play broadcasts of a sporting event while watching the video on TV. This used to be easy because the radio and TV were broadcast without any sort of delay. However, now with satellite feeds and digital broadcasts, the video may be delayed by as much as 10 to 15 seconds. This is very distracting and ruins the enjoyment of the game. The Audio Delay program allows you to feed your radio's audio through your computer and introduce a variable delay of from 0.1 seconds to several minutes. This makes it easy to synchronize the radio audio and the Television video. New Version - 12-8-2016. This version fixes a problem that produced regular pulses and noise on some computers when the program was run in stereo or 16 bit mode. The program also has an Oscilloscope-style display that allows you to see the wave-form of the signals coming into the program. Spectracizer. 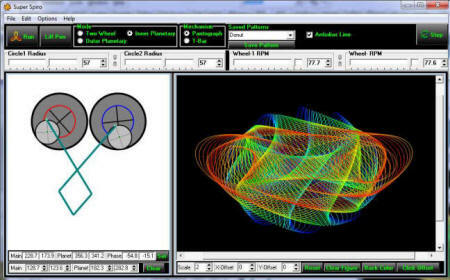 Spectracizer is a program that allows you to do spectrum analysis on your PC. The programs takes audio signals fed to the sound card on your computer and does real-time spectral analysis on displaying graphs the spectrum. Spectracizer can analyze signals ranging from 1 Hz to over 22Khz. It turns an inexpensive laptop into an instrument that can replace equipment costing thousands of dollars. 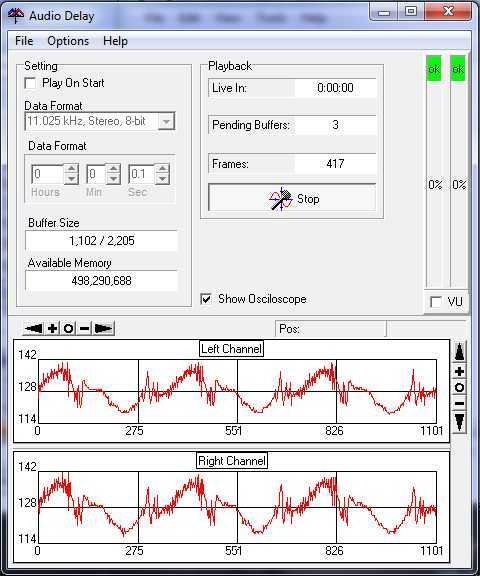 The program can also analyze and dissect audio files. Finally, it can also generate synthetic wave forms and play through the PC's speakers. The spectrums can be displayed as standard graphs or as spectrograms which displays changes in the signal over time. Car-Buy-Rater. Car-Buy-Rater is a program for evaluating a used cars before you buy. It works by calculating the amount of useful life left in a vehicle and how much it costs per unit. That gives you a precise estimate of the value of the car and makes it easy to see which cars are the best value. Car-Buy-Rater can save you thousand of dollars on your next used car purchase by getting you the best deal. The program doesn't require "Blue Book" values, so it will work old cars as well as new ones. Terrain Modeling. 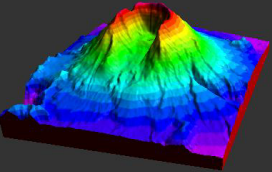 Estierra is a complete terrain modeling software system. It converts Digital Elevation Model files into photo-realistic 3D terrain that can be viewed and manipulated in real-time. The terrain models can be overlaid with aerial photographs to give photo-realistic views of the land surface. 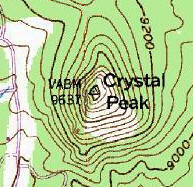 They can also be overlaid with topographic maps to allow precise location of land marks and terrain features. This is similar to Google Earth, but the terrain models are higher resolution and narrowly focused on small areas. Xedit. Xedit is an editor specifically designed for writing programs, but it’s also useful for writing any kind of text. 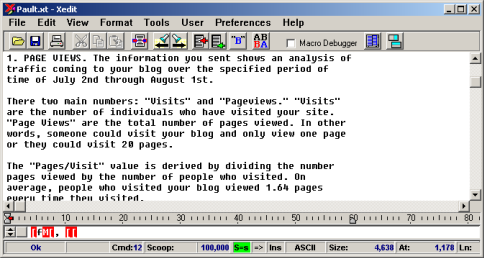 Xedit is not a word processor and it does not have fancy word processing features. Instead, it concentrates on being fast, powerful and efficient. It makes an ideal replacement for Notepad. EXPL. 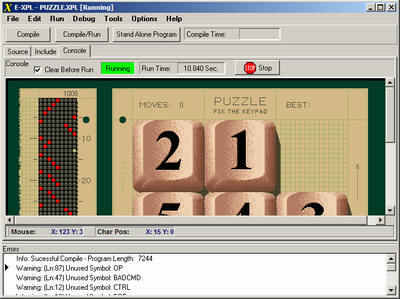 EXPL is a specialize version of the XPL programming language that allows for program development under Windows. This version of the language includes an IDE with a code editor, compiler and simulated DOS/VGA console that emulates 61 Standard CGA, EGA, VGA, and Vesa Modes. It also includes a debugger that allows the programmer to single step through programs, view variable values, change variable values, set break points and step through the low-level I2L opcodes that compose the program. Finally, the language includes a set of more than 40 extended instrinsics that handle the functions that would be handled by DOS or assembly language in previous versions. Update. Microsoft announced in 2012 that it was discontinuing their Map Server that Topo-Grabber used to get its topo maps. So many people complained that for a while, Microsoft relented and continued supporting the server. Since then, the server has been up and down. For example, for several months around the beginning of 2015, the server was down. Later around the middle of March 2015, it was back up, at least for short periods of time. I don't know what this means for the future of the software. I will keep watch the situation, and if it is unreliable, I'll look for a new server. Arachnid is a computer solitaire game originally written by Ian Heath in the early 1990's. 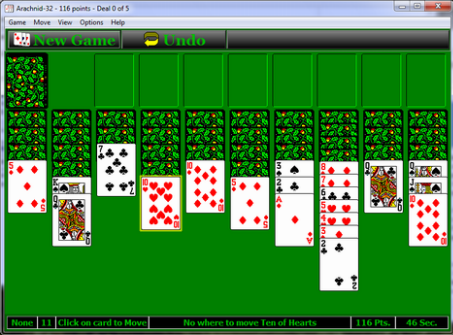 It is my favorite solitaire game and one of the most challenging solitaire games that I have ever played. I've enjoyed playing Arachnid so much that I have moved if from computer to computer, through various operating systems starting with Win 3.1 and continuing through Win 95, Win 98, Windows XP, Windows Vista, Windows 7 and Windows 8. 16-Bit Program. Since it was originally written for Win 3.1, Arachnid is a 16-bit program. Although it still works fine with all 32-bit versions of Windows, 16-bit programs will not work under 64-bit versions of Windows. For this, reason, I wrote Arachnids-32, which will run under 64-bit versions of Windows. Eight Across is a challenging Solitaire game. 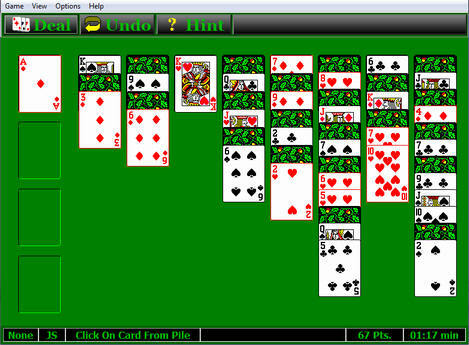 It is more interesting and harder than the classic solitaire game and about the same level of difficulty as Arachnids. This version of the program is based on a DOS program by Loren Blaney. The game was shown to him by Margret Rosenberg. 3D Mandelbrot. 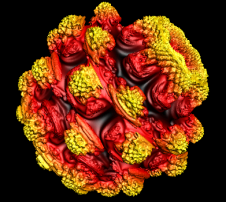 This program generates 3D Mandelbrots using Daniel White's formula. Daniel's formula is an extension of the standard 2D Mandelbrot. Most people use tracing to render his 3D Mandelbrots, but I thought it would be interesting to try OpenGL and 3D modeling. A 3D model would have the advantage that you could manipulate it in real time. The image to the right shows an example of what the program can create. Super Spiro is a program that draws broad range spirographs that go far beyond the drawings made by the popular toy. The typical spirograph generates patterns called Guilloché patterns. Guilloché patterns are regular, symmetrical, circular patterns and a bit boring. Super Spiro can generate these patterns but it can also generate complicated, non-circular and asymmetrical patterns that are far more interesting.